In one of the most useful workshops I’ve attended, we created a customer-journey map for content planning. 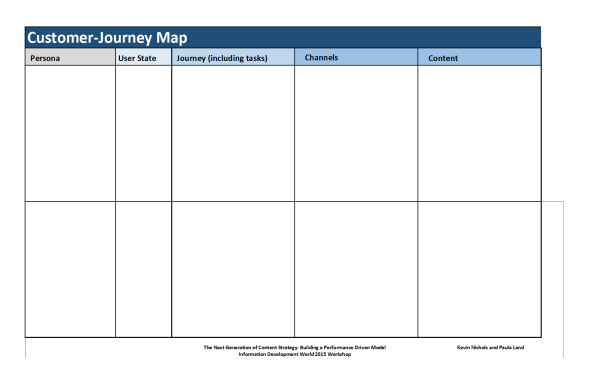 Before doing this exercise, I had only a fuzzy notion of what a customer-journey content map might look like, how to make one, and why anyone would bother. It turns out, this map looks like a spreadsheet. You make one by filling the cells. Let me back up to clarify the term “customer journey.” In this exercise, we didn’t talk about the customer journey in the way that marketers typically see it: a journey through a sales funnel’s ever-narrowing phases — awareness, consideration, preference, and (kerplunk!) purchase — as helpful as mapping content to those phases may be. We talked instead about customer journeys as things that people want to accomplish as they interact with a brand. We mapped content to customers’ goals. The exercise I share here was part of a full-day workshop at the Information Development World conference in San Jose. The session — The Next Generation of Content Strategy: Building a Performance-Driven Model — was led by independent content strategists Paula Land and Kevin Nichols. They covered a lot of related topics; I wish I could cram all of them into this post. The content-mapping exercise alone had such value, though, that I focus on it to give you a tool you can use right away. Paula and Kevin kicked off this exercise by breaking us into teams. They asked each team to imagine itself in charge of deciding what content Starbucks should create for two personas: Faye Weaver and Lila Chan. In addition, each team received a customer-journey map template. Let’s say you’ve just received those three handouts. What would you do? In our exercise, the first column, Persona, was completed: Business Traveler in one row, Student in another row. Starting with the customer may seem obvious, but content decisions don’t always happen that way. Have you ever created content because your boss had a pet idea or because you found a certain topic fascinating? I confess that I have. Column 1 is column 1 for a reason. 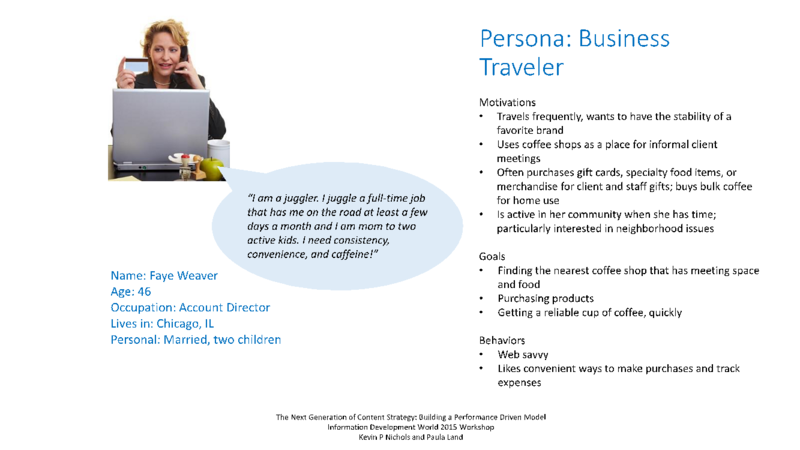 Kevin and Paula noted that when we do this exercise for real — when we choose our own personas — we would prioritize in keeping with the 80/20 rule, choosing personas that account for most of our anticipated business. Takeaway: When deciding what content to create, start by selecting the personas (or typical customers or segments) on which you want to focus for your business goals. The second column, User State, was completed with Anonymous for both personas. In some cases, users are logged in (for example, when they’re using certain apps), so the system knows information about them, including who and where they are. The user state determines the potential for personalizing (adapting) the content as it’s delivered. The user state also might determine the potential for gathering data that could help the organization learn about user preferences and needs. For the purposes of our exercise, having the user states provided simplified our assignment; since our customers were anonymous, we knew that we wouldn’t have to plan for customized content experiences. If you were using this worksheet in real life, you’d probably want to bump the User State column further to the right, maybe following Channel. After all, how can you think about the user state until you know whether you’d want to put the content in an app or on a poster? Takeaway: When deciding what content to create, consider how much your system might know about the user and how you might use that information to enhance the user experience. The third column, Journey, was blank for both personas. As noted in the beginning, Kevin and Paula suggested that we define customer journeys as customer goals — things people want to accomplish as they interact with a brand. In the context of this exercise, a customer journey answers this question: What does this persona want to do? Of the infinite customer journeys we could have chosen for either persona, we were instructed to choose those that we imagined would support Starbucks’ goals. My teammate and I chose one journey per persona: “Get a cup of coffee” for Faye (business traveler) and “Get a part-time job” for Lila (student). We justified prioritizing these journeys because Starbucks needs to sell coffee and hire people. Takeaway: When deciding what content to create, consider what your key personas want to accomplish as they interact with your brand. Focus on those customer goals that matter most to your organization; content marketers need to keep one eye on customer needs and the other on business needs. After choosing customer journeys (goals), we broke them down into customer tasks that might require discrete pieces of content. Each step in the journey was given its own row in the customer-journey content map. Kevin noted that while the Starbucks example comes from the world of retail, the worksheet also works for B2B purposes by asking the same basic question: What do our customers and prospective customers want to accomplish as they interact with our brand? Takeaway: When deciding what content to create, break down customer goals into tasks that can be mapped to information needs. We must immediately add the second-most important question: When is this content required? In the fourth column, Channel, we considered which communication channels our personas would probably use. Paula and Kevin reminded us that channels include print materials (brochures, coupons, product packaging, posters, etc.) and places where people interact (events, telephone calls, checkout counters). They also reminded us that customers sometimes use multiple channels at once. Who hasn’t consulted a smartphone while watching TV or working on a computer? All channels in a user-journey step are listed in the same row. You could come up with more and possibly better choices. In the exercise, we weren’t aiming to get it right. We wanted to become familiar with the framework. We were learning by doing. This column got me out of my automatic thinking. When you’ve delivered information in certain ways over and over, it’s easy to go with your default distribution channels (another blog post, print poster, and so on). Standing back and looking at the range of channels from a customer point of view gets you thinking of new possibilities. 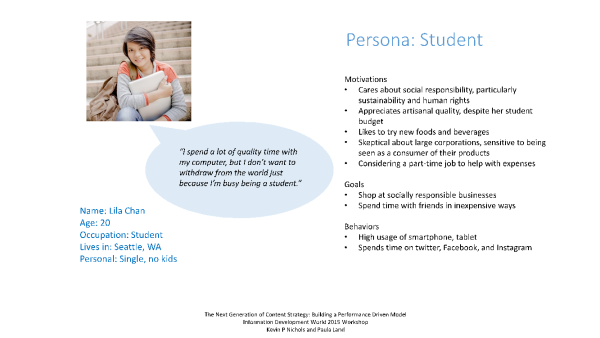 Takeaway: When deciding what content to create, consider which channels your key personas are likely to use. Avoid mindless repetition of what you’ve done. Avoid guessing; look at user research. Plan for all relevant channels, including print and venues for human interaction. Finally, after we had filled in the first four columns as a basis for making customer-centric decisions, we were ready to fill in the last column: Content. To keep us from getting stuck thinking in terms of web-based content, Kevin and Paula defined “content” as any information that is recorded. A cave drawing, for example, is content. So is a script. Career info: job openings, policies, etc. Given more time, we would have done the actual mapping, assigning channels and content to each task. Then we would have identified gaps between Starbucks’ existing content and the content Faye and Lila needed. Finally, we would have decided which projects to tackle first. Each piece of content gets its own row. Takeaway: Map your content to the tasks in your customer journeys, specifying which channels and formats are likely to work best. Choose your key personas or segments. Identify possibilities for personalization and data gathering. Choose customer goals and tasks that might require information. Brainstorm content ideas for each task. After that, you don’t get to put your feet up for long. Paula and Kevin suggest revisiting your customer journeys every six months. People change — who knew? A content marketer’s job is never done! 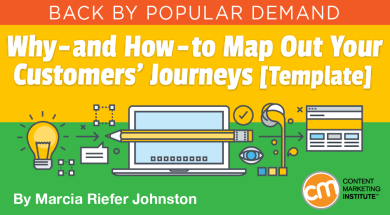 How do you map your content to customer journeys? Please let us know in the comments.